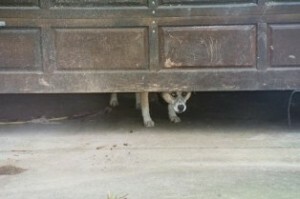 I recently had an email inquiry from someone who was worried about a neighbor’s dog that has been locked up in a garage during the daytime for many months (there was no mention of night time hours). The dog appeared to be very distressed, and was said to spend large parts of the day whining and barking, and generally sounding distressed. 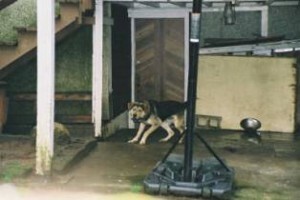 The concerned neighbor had initially contacted the City of Calgary because of the excessive barking the dog demonstrated when it was housed in a small caged area beside the garage. At that time, the neighbor believed the dog was being fed and watered appropriately. 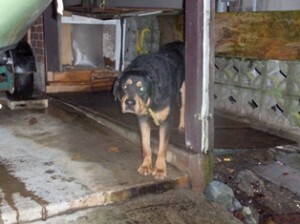 However, after the city bylaw officers visited the house, the dog was moved into the garage by the owner and since then, the dog had only been heard and not seen. The concerned neighbor wasn’t sure what to do as he didn’t know what the living conditions of the dog were inside the garage, but only knew that the barking and whining had persisted and actually escalated. The SPCA were contacted, but because there was no evidence that the dog lacked basic necessities such as shelter, food or water, there was nothing that they could do to intervene in the situation. 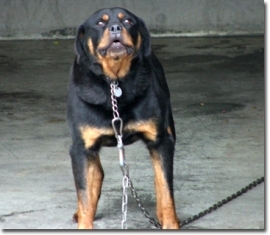 Unfortunately, there are no good statistics on how many dogs are “managed” in this kind of fashion, just as there are no good statistics about how many dogs are actually chained or kept in other confined conditions by their owners. So for the more intelligent of the human race willing to consider other alternatives, I would suggest that as an owner who is away for long periods of time, it is NOT appropriate to leave a dog in a garage. If time away from home is the rule and not the exception for a dog owner, it would be prudent and much more humane to consider surrendering the dog to a local humane society or shelter for adoption by an individual who does have the time, energy and compassion to give the dog. Dogs are “pack” animals, generally very social by nature and they thrive on being around human beings. 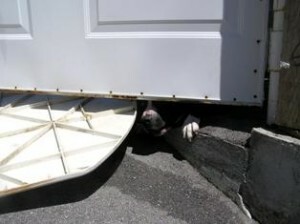 Leaving a dog alone day after day in a non-stimulating and unsafe environment is emotional neglect, plain and simple. 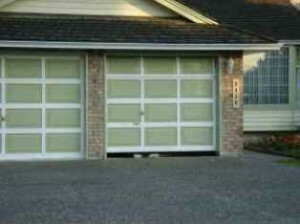 If more rationale is required, one could also argue that the environment of a garage can also be very dangerous if the temperatures are inconsistent or fluctuating and/or if the animal is unintentionally exposed to chemicals or poisons. 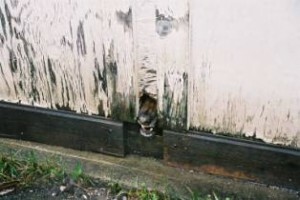 What can you do if you become aware of a dog that is left alone in a garage for long periods of time? There is no easy solution to this problem since experience has demonstrated that organizations such as the SPCA may be hesitant to intervene unless there is evidence that the dog is being deprived of adequate shelter, and food/water. It may feel uncomfortable or unsafe to talk directly to the owner to express concern, and in some situations, this may actually worsen the situation for the animal if the owner feels that their intentions are being questioned. So then what? The important thing that one shouldn’t do is shrug their shoulders and give up on the animal in need. There is always something one might consider, but it might require some ingenuity or consultation with others to find a solution. Perhaps it is doing further investigation to discover the conditions that the animal lives in (can it be determined if the animal has food and water? – if the animal doesn’t, then a complaint to the SPCA can be made), or it might mean talking to an animal bylaw service officer or a staff member from a local shelter to assist in helping to determine next steps. Maybe it could be considering writing a respectful, anonymous letter to the owner to help bring attention to the animal’s situation and help to educate the owner about viable options. Or one might need to consider more assertive options. Without any advocacy at all however, one day will slip into another and turn into months and then years for a forgotten dog that has no hope of assistance or relief from a life of loneliness and emotional torment. 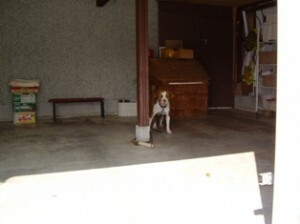 This entry was posted in Animal Advocacy, Dog Rescue. Bookmark the permalink.